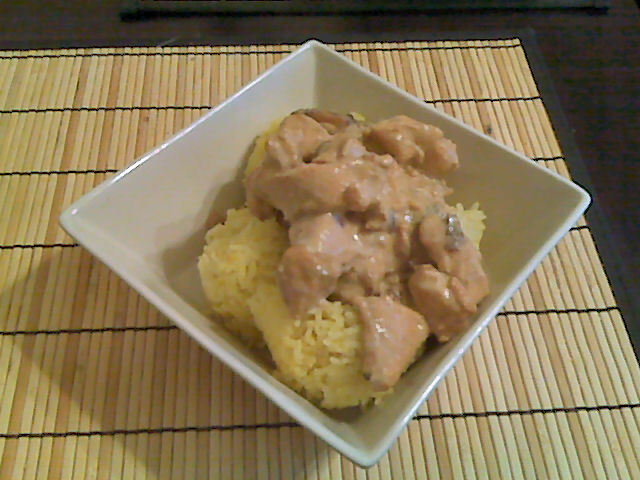 Also known as royal chicken korma. A tasty chicken dish cooked in yogurt. So tasty, so creamy, so naughty if you order it in a restaurant. Oh how I love my korma! Thankfully, I can still have my korma and lose weight too. Again, no need to remind folks of how healthy the yogurt part is. Hurray for yogurt! Usually Shahi Murgh is done with whole chicken pieces but I opted for cubed chicken just for ease of cooking. I also loved how the house smelt after cooking this dish. All the aromatic herbs in this dish made the house smell like those delicious spice stores. Mmmmm. Combine the 1 cup of yogurt, pepper, cumin, cayenne, and garlic. Set aside. Spray the pan, add cardamom, cloves, and cinnamon. Stir, once they are aromatic add the chicken. Brown and transfer to a bowl. Add the raisins and almonds and stir until the raisins begin to plump. Add the chicken and yogurt mix. Stir and simmer covered on low for 20 minutes. Stir occasionally. Uncover, raise the heat to medium to reduce the sauce. Remove the whole cardamom and cloves. Stir in the 3 tbl of yogurt and serve. Makes four servings. Each serving has 206 calories, 3.4 g of fat, and 2.5 grams of fiber. I recommend servings this on the turmeric rice I had posted yesterday. The two have such great flavours when served together. I had made this dish with the hopes of having leftovers to pack for my husband’s lunch but he liked it so much there were no leftovers to be found. Hehe, I guess that means it was very tasty! This entry was posted in Dinner and tagged Chicken, yogurt. Bookmark the permalink.